Nicelucky's coffee dripper is reusable, so you never need to buy wasteful paper filters. It also maintains the authentic taste of your coffee, which is distorted by most paper filters. After each brew, you can clean it under warm water or just put it into a dish-washing machine. Nicelucky's coffee dripper is exquisitely made, in an innovative and humanized design. Each brew is an enjoyable coffee moment. The fine mesh of the dripper is laser cut, perfectly capapble of screening. It maintains the essential flavors and aroma of your coffee while filtering all coffee grounds. Nicelucky's coffee dripper is made of high-quality stainless steel, highly resistant against rust, stain, and corrision, which makes the product extremely durable. Nicelucky's coffee dripper proves to be a good helper for every coffee lover. The exquisite device is compact and lightweight, easy to carry - you can enjoy incomparable coffee even when you go camping! Your satisfaction is what drives us to provide the highest quality kitchen products on the market. If at any time you are not completely satisfied with your purchase feel free to return it to us for a full and prompt refund. Click the "Add to Cart" button and ORDER NOW your Nicelucky coffee filter TODAY! 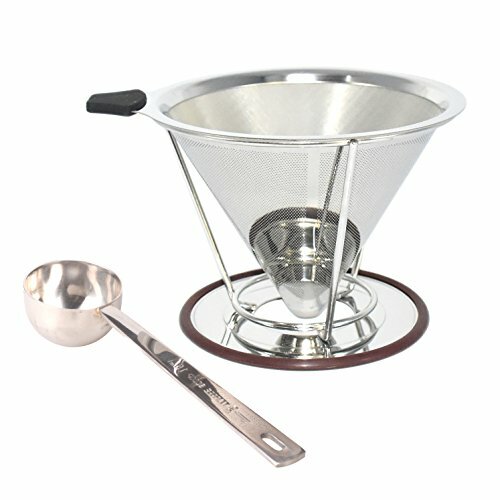 ★ 100% CUSTOMER GUARANTEE - We're confident you'll love this stainless steel coffee pour over filter. However, if you're not completely satisfied, we'll give you a 100% refund with NO QUESTIONS ASKED. ORDER NOW!! If you have any questions about this product by nicelucky, contact us by completing and submitting the form below. If you are looking for a specif part number, please include it with your message.